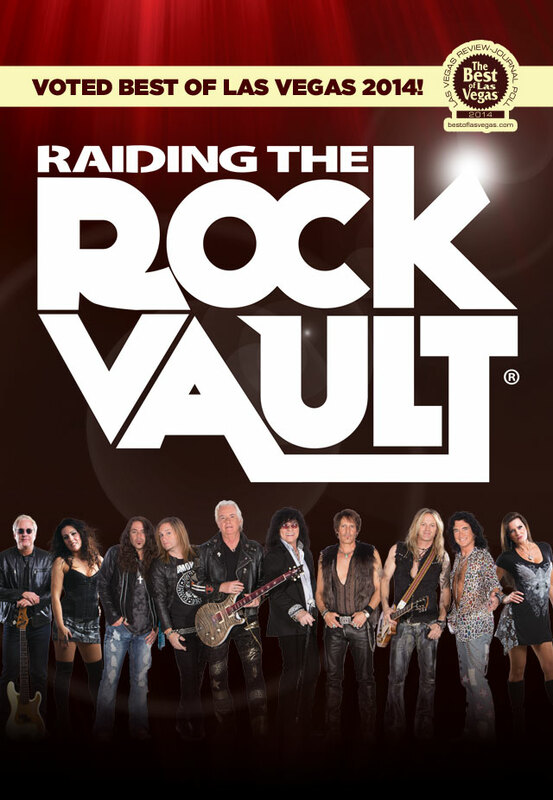 Come and Raid the Rock Vault in Las Vegas! RAIDING THE ROCK VAULT SHOW is The Story of Classic Rock, and is comprised of members from some of the greatest rock bands in music history. 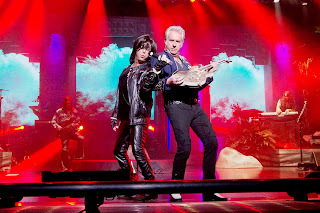 Narrated, sung and acted along with compelling imagery including historical footage, RAIDING THE ROCK VAULT SHOW transports the audience back in time to experience a magical musical journey from 1948 to 1989. With classic rock anthems from The Rolling Stones, The Who, The Doors, Led Zeppelin, Jimi Hendrix, The Eagles, Queen, AC/DC, Deep Purple, Van Halen, Journey, Toto, Free, Bryan Adams and more, Raiding the Rock Vault Show truly boasts "The Greatest Set List Ever." 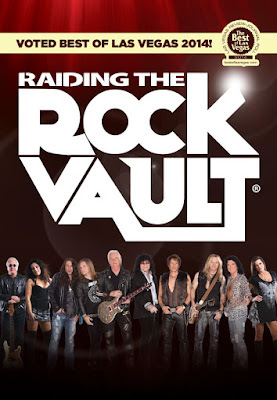 RAIDING THE ROCK VAULT SHOW features timeless gems translated on stage live and loud by an all-star band comprised of some of classic rock’s legendary musicians. 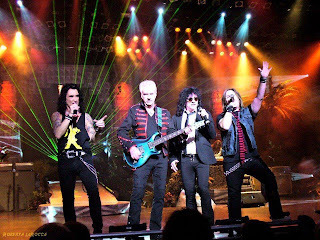 Howard Leese [Guitar] (Heart, Bad Company), Tracii Guns [Guitar] (LA Guns, Guns n’ Roses), Robin McAuley [Lead Vocals] (MSG, Survivor), Paul Shortino [Lead Vocals] (Rough Cutt, Quite Riot), Jay Schellen [Drums] (Hurricane, Asia), Andrew Freeman [Lead Vocals and Guitars] (Lynch Mob, The Offspring), and Michael T. Ross [Keyboards] (Lita Ford, Hardline, Angel). 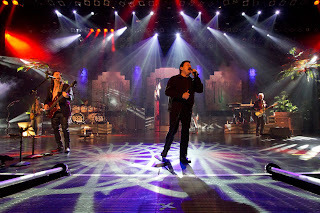 VegasOnDemand.com has a great deal on these Las Vegas show tickets, at the Tropicana Las Vegas! Special guest performers will drop by every couple of weeks. Recently (pictured above) Joe Lynn Turner [Lead Vocals from Rainbow, Deep Purple] joined the show as a special guest artist. The Real Deal Vegas Rock Show with REAL ROCK STARS! 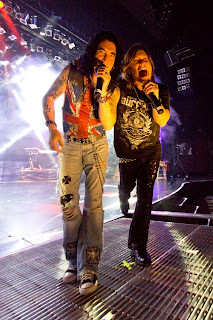 Raiding the Rock Vault in Las Vegas is the HOTTEST show! LAS VEGAS – Actor, comedian and singer Jon Lovitz will bring a dose of laughter to Flamingo Las Vegas when he performs a limited engagement in the iconic Flamingo Showroom March 16 and 17, 2012. 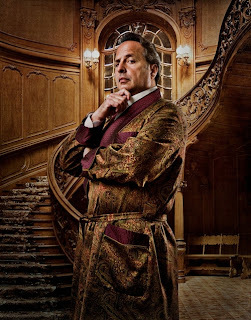 Shows will be at 10 p.m.
Lovitz has been one of the world’s most recognizable comedians for almost three decades. While a member of the famous comedy group “The Groundlings,” Lovitz appeared on “The Tonight Show with Johnny Carson,” which led to his first movie and television roles, as well as a coveted spot on “Saturday Night Live.” In his five years on the series, Lovitz was nominated twice for an Emmy Award and became known for some of the series’ most well-known characters, including “Tommy Flanagan of Pathological Liars Anonymous,” “Master Thespian,” “Hanukkah Harry” and “The Devil.” Lovitz has appeared in more than 30 feature films, including “Big,” “A League of Their Own” and “The Wedding Singer” and has guest starred on television hits such as “Friends,” “Seinfeld,” “Las Vegas” and “Two And A Half Men.” Known for his distinct voice, he has done voiceovers for many animated television shows and movies. After success on the big and small screens, as well as Broadway, Lovitz decided to pursue his dream of becoming a stand-up comedian and has been touring the country for the past several years. In addition, he recently opened The Jon Lovitz Comedy Club at Universal CityWalk in Hollywood, Calif., which features live stand-up comedy by some of the hottest national headlining comedians. Ticket prices are $48.60, $70.60 and $93.17 for VIP seating, which includes a drink. Tickets are available at the by phone at (702) 538-9000 or 1-(888) 505-5211 or by visiting www.VegasOnDemand.com. Flamingo, along with all Caesars Entertainment Las Vegas resorts, including Caesars Palace, Planet Hollywood Resort & Casino, Paris Las Vegas, Harrah’s, Bally’s, Rio All-Suite Hotel & Casino, Imperial Palace and Bill’s Gamblin’ Hall & Saloon, proudly prohibit adding hidden resort fees to hotel guest room rates. For information on No Resort Fees visit www.caesars.com/vegasnoresortfees. 2011 TicketsOnDemand.com/VegasOnDemand.com. Theme images by rami_ba. Powered by Blogger.